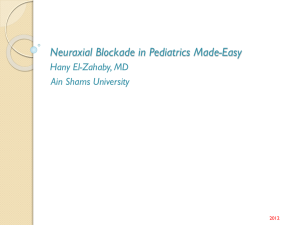 • Fetal bradycardia after neuraxial block. • Neurological deficit after neuraxial block. 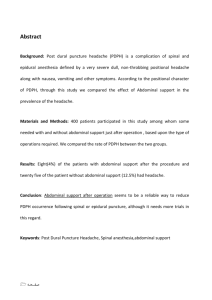 • Post dural puncture headache. 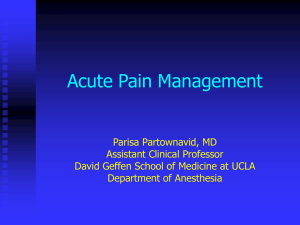 • How does Anesthesia proceed? 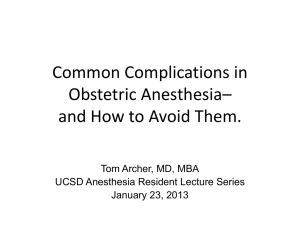 anesthesia drugs per se, not uterine perfusion. – Will best protect mother and baby. 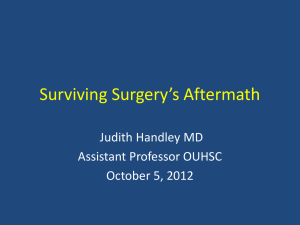 – Lack of sympathectomy in case of blood loss. 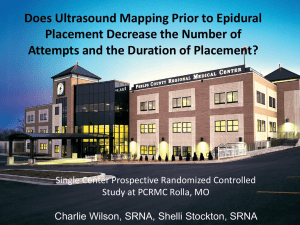 – Useful suppression of uterine contractility. 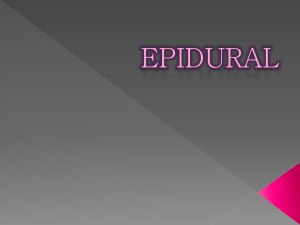 – Compatible with heparinization for vascular repair. Major trauma in pregnant patient. blood available, arterial line if possible. Hct, oxygenation-- all guided by FHR. etc) despite non-viability of fetus. • All our drugs are “safe” for baby. variability don’t be fooled into a CS! • FHR variability will disappear with GA.
• FHR should stay high, however. pain. 6 cm dilation, everything normal. • Easy CSE  complete, rapid pain relief. • What is going on? • FHR stays down, despite LUD and O2. • What should be done? • Differentiate by palpating uterus. Case 3: Fetal bradycardia after CSE. 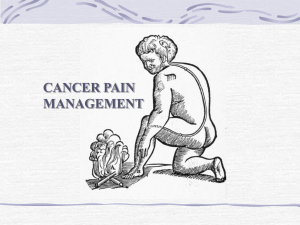 Consider stopping oxytocin before CSE for severe pain. of CSF. Unable to pass catheter at L3-4. Successful attempt, with difficulty, at L2-3. started at normal rate at 0300.
hand grip but can barely move legs. pain relief. Delivers OK at 0800.
gone by morning. Pt DC’d. (48 h after delivery) C/O positional HA. Denies fever, malaise, anorexia, vomiting. Comes in and gets epidural blood patch. • HA recurs next AM (72 h after delivery). • HA slowly resolves over next two days. few hours after dural puncture. 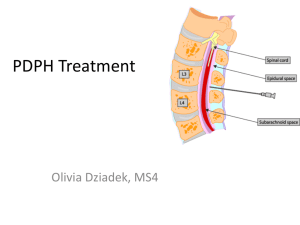 resistance to air” technique for epidural). • Most practitioners use LOR to saline, not air. Figure 1, performed on the same patient a week later. nerve), but these changes are rare. area and an older bleeding site (bottom arrow). region when patient sits up. vessels dilate to fill up the space. Do not do it in first 24 hours of HA. Avoid ER? But consider alternative Dx. Involves risk of second dural puncture. Do not promise a cure. required before a third EBP. 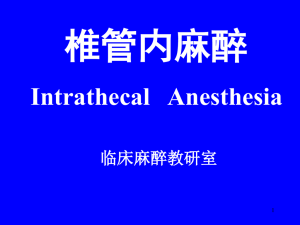 intrathecally use for labor analgesia. seal the dural hole after removal. 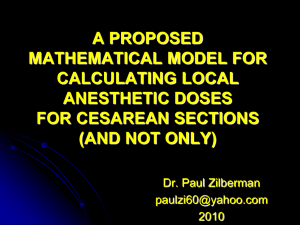 • Possible reduction in PDPH rate. knots and cover with tape– no injections! Inform nursing and anesthesia staff. • Anecdotal support for efficacy in PDPH. buckles when she puts weight on it. 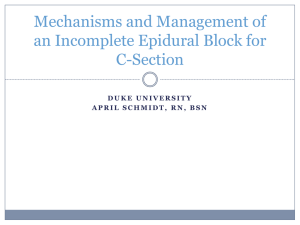 are not due to the epidural! compressed by stirrups at fibula. rami. What are the rami, again? Adapted from Cole JT. Maternal obstetric paralysis. 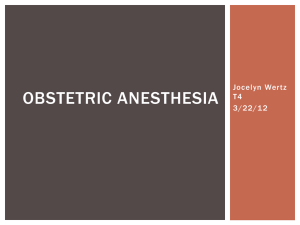 Am J Obstet Gynecol 1946; 52:374. Place hip wedge under bony pelvis rather than buttock. to minimize numbness and allow maximum mobility. • Don’t minimize or ignore the problem. • When in doubt– consult. vaginally in the PACU after CS under GA.
can be reversed by oxytocin. excellent relaxation / rapid closure. is weak, despite being conscious. • What could have been done differently? muscle relaxant not really needed, usually. Just avoid cough, strain, etc. will increase effect of NMB agents. ventilator for a few hours. • Smooth muscle relaxant (dilator). • Treated with NTG IV, 100 mcgm. • BP falls from 110/60 80/40. will not contract uterus but will raise BP. • Terbutaline will not decrease BP. units, IV volume increased BP. a few more small doses of epinephrine (510 mcg). • Observed in ICU for one day. • I am not aware of any further problems. effective. Adjunctive use of vasopressin? • Abundant IV volume administration. • Be ready to intubate, but not needed here. • Comments from OBs about this case? 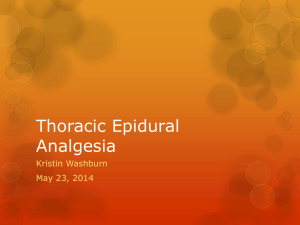 Kristin Washburn: "Thoracic Epidural Analgesia"